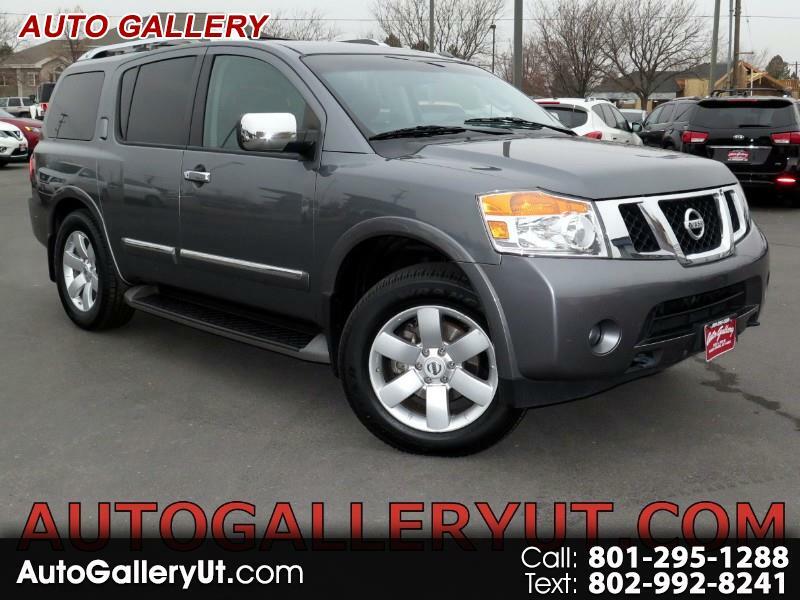 2014 NISSAN ARMADA SL 5.6L V8 4X4, gray with black LEATHER, SUNROOF, wheels, rear BACK UP CAMERA, cd player with PREMIUM SOUND SYSTEM and steering wheel audio controls, 3RD ROW SEAT, bluetooth connection, a/c with dual climate control and rear a/c, fog lights, HEATED SEATS, keyless entry with keyless start, power rear liftgate, tinted windows, running boards, tow package, luggage rack, woodgrain interior package, homelink, traction control, and lots more! Clean title! Remainder of Factory warranty or extended warranty available. The best used cars available in Bountiful, Woods Cross, Davis County, and Salt Lake City. For more pictures and details and to view our other used car inventory and cars like this please visit www.autogalleryut.com DL 4527 For assistance call 801-295-1288 Thank you and hope to hear from you soon! Visit Auto Gallery online at autogalleryut.com to see more pictures of this vehicle or call us at 801-295-1288 today to schedule your test drive. ALL VEHICLES HAVE CLEAN & CLEAR TITLES. HAND PICKED FOR QUALITY. PREINSPECTED IN BOUNTIFUL FOR IMMEDIATE DELIVERY. Most of our vehicles have FACTORY WARRANTY AT NO COST OR EXTENDED WARRANTIES ARE AVAILABLE. FINANCE at LOW CREDIT UNION RATES oac. We BUY CARS,4X4 TRUCKS AND SUV'S. We reserve the right to make changes without notice. Not responsible for errors or omissions. CALL US FIRST. EASY LOCATION IN THE BOUNTIFUL, WOODS CROSS, SOUTH DAVIS, UTAH AREA. DL# 4527 Sales Tax, Title, License Fees, Dealer Documentary Fee, and Emission Testing Fees are additional to the advertised price. Point of sale is in the Bountiful, Utah area.